Learn a meditation, goal setting, and how to gain information from your higher self. 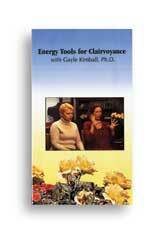 Gayle Kimball, Ph.D., compiled an encyclopedic book about how to develop your clairvoyant and healing abilities. Learn to use visualization, intention, touch and other simple techniques. Includes scientific explanations and case studies sharing her experiences and those of her readers and students. Includes 25 illustrations. Three videos/DVDs and meditation CD are also available. 390 pages. 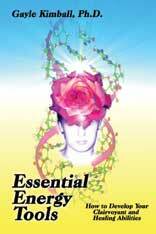 “The energy tools have given me the gift of a key to unlock the magical world of focus. The tools have helped me to more fully appreciate humor, that Joy is more than a dishwashing liquid!” Lavon Divine-Leal, RN. Learn how to use visualization and intention to feel centered, have more energy, ground, enhance the atmosphere of your home and office, and achieve goals. Gayle Kimball, Ph.D., demonstrates the energy tools with four students, enhanced by animated color graphics. These techniques to harness the power of the mind will transform your life and increase your enjoyment. This video teaches how to increase your intuitive abilities with a meditation technique and specific steps to do clairvoyant readings and clearings. Learn a simple template on which to see your insights. Includes demonstrations by Dr. Kimball and students, as well as animated graphics. Kimball has done clairvoyant readings and workshops in countries ranging from Japan to Canada and the US. 55 minutes. 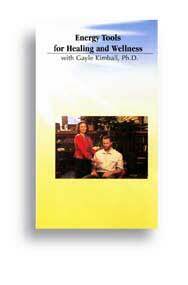 Demonstrates how to do aura reading and clearing, hands-on healing and meridian clearing. The techniques are illustrated as animated graphics. This tape builds on tapes #1 and #2. 55 minutes. 1,500 young people report on their experiences and coping techniques. Dr. Kimball adds information, new quotes from adult experts, phone help lines, organizations, Internet resources, and books. Topics include peers, family, school success, work, community involvement, body, feelings, sexuality, and drugs. Information specifically for boys, as well as girls. A proven resource for schools, parents and teens. “It’s a fun, interesting book that is guaranteed to make growing up easier. The book combines the wisdom of young people with Dr. Kimball’s research for a useful and important resource. The book will be read, reread, underlined, marked, and loved by every young person who reads it.” –Teen Voices magazine editor Alison Amoroso. “Full of great advice for kids, and parents too. In many ways it’s a peer support group in print.” –Elizabeth McGonagle, school social worker, founder of Banana Splits.